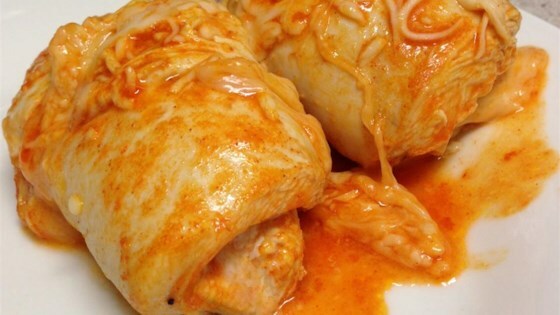 "Delicious chicken breasts marinated in hot sauce and filled with shredded Provolone cheese. Serve with Ranch or blue cheese dressing! Blue cheese lovers may substitute blue cheese for the Provolone." In a small bowl, stir together the melted butter and hot sauce. Place chicken breasts in a glass bowl, and pour the sauce over. Turn to coat, cover and refrigerate for 15 to 20 minutes. Preheat the oven to 400 degrees F (200 degrees C). Remove chicken breasts from the hot sauce, and place 1 tablespoon of cheese in the center of each one. Roll up, and secure with a toothpick. Repeat with remaining breasts, and place them seam side down in a glass baking dish. Cover the dish, and bake for 30 minutes, or until chicken is fork tender. Increase the temperature of the oven to 450 degrees, and place the chicken 8 inches from the heat. Uncover, and bake for 5 minutes, until browned. Garnish with remaining shredded cheese, remove toothpicks, and serve with ranch or blue cheese dressing. Watch how to roll and wrap the ultimate party snack. Messy & cheese is unneccessary. Tried again and found the best was to pound the chicken breast so it wasn't so thick and then coat in hot/buffalo sauce. It was better. These were pretty tasty! I didn't have any provolone on hand so instead I used string cheese mozzarella which the chicken wrapped around perfectly.